Discover the city from where Spanish kings forged their empire, the place where the three great cultures of Middle Age got mixed like nowhere else, in this comprehensive tour departing from Madrid. 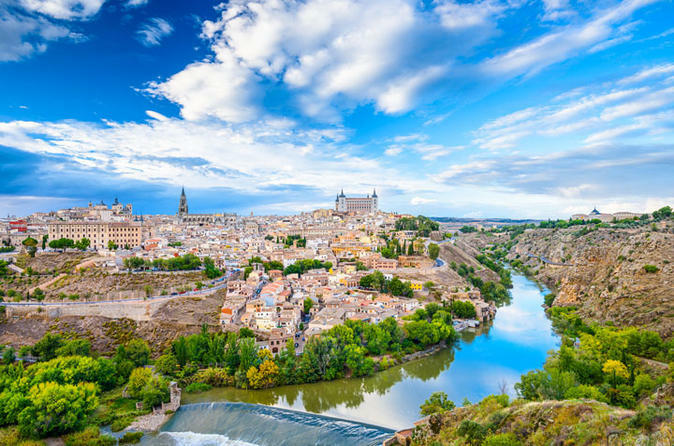 You will dive into the history of our country with a complete walking tour in the narrow streets of Toledo, visiting the Synagogue of Santa Maria la Blanca, the monastery of San Juan de los Reyes, the church of "El Cristo de la Luz", and, of course, the impressive Cathedral, one of the most important of the country. Enjoy a complimentary pick up service from your hotel to the departure point, located in the center of Madrid -only for selected hotels. Departure from Madrid at 8:45 am or 9:00 am, depending on the option you choose. and admire the facade of the impressive Cathedral, free time. Visit inside the Cathedral is optional. Continuation to the old Palace of Justice and the City Hall. You will continue our walk through the old Jewish quarter with ts narrow streets to visit the Church of St. Tomé, with the very famous painting of El Greco "The Burial of Count Orgaz", the old Synagogue of St. Maria la Blanca, which remains as a symbol of the coexistence of the "Three Cultures", Monastery of San Juan de los Reyes. We ́ll also finish the tour visiting a typical factory of Damasquino, well known handicraft art of Toledo, and watching a live performance of this traditional art. You can upgrade your experience choosing the option to visit the cathedral, or having a touristic or gourmet lunch.